This ridge of sand-stone, known as the Lower Greensand, lies north of the Chiltern Hills. Unlike the chalk downs of the Chilterns, this area is well-wooded (seen in the distance); the soils are too poor and well-drained for good faming. Greensand is so-called because it contains a green iron-rich mineral called glauconite, that forms in shallow seas. Fossils of sea-shells are also found. 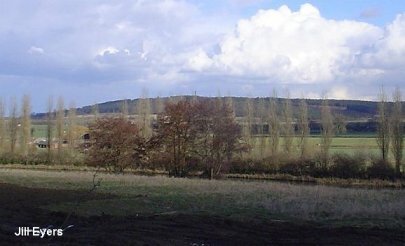 The greensand ridge is actually a low escarpment; the larger chalk escarpment of the Chilterns lying above it, and to the south-east, separated by a low-lying clay vale.